New ILO Member Serving Ajax Coming Soon! In Ajax, it sometimes feels as though winter ice, slush, and snow occupy more days than do sunshine and iced cappuccinos. Slip, trip, and fall accidents are unfortunately commonplace in Southern Ontario but winter weather conditions are not the only cause. A slip, trip and fall may be a familiar risk, but these incidents often cross the line from faultless misfortune to punishable negligence. We may laugh at videos of banana peels or workplace “falls,” but for Ajax residents involved in such accidents, the resulting injuries are far from funny. Slip, trip, and fall accidents are simple mishaps that can have serious lasting effects. The slightest oversight—such as unsalted ice on a sidewalk, an unobserved spill, or a worn-down step—can result in serious injury that may affect one’s ability to work, care for dependents, or carry out day-to-day tasks. The consequences of such injuries can range from minor inconveniences to major life changes. Victims who find themselves suddenly dependent on family members for mobility, care, or income may suffer emotional and psychological damage in addition to the physical and financial injuries already endured. Slip, trip, and fall accidents are not only common in Ajax, but across the country. Slip and trip related falls account for 17 percent of time-loss injuries in Canada each year. These accidents can occur anywhere and to even the most cautious of individuals. The most common causes of slip, trip, and fall accidents are listed below. Some basic precautions can be taken to help prevent slip, trip, and fall accidents. Individuals can reduce their risk of falling by wearing appropriate footwear for varying weather or workplace conditions; adjusting their pace to suit the walking surface; or using the flashlight feature on most smartphones to illuminate poorly lit areas. Business owners should be especially vigilant in limiting slip- and trip-causing conditions to ensure the safety of their customers. Proactive responses include snow and ice removal from sidewalks, paths, and steps; keeping all walking paths free of obstructions or unanchored objects, such as cords or rugs; attending to spills or wet surfaces immediately and making use of wet floor caution signs; and maintaining flooring properly. Still, accidents happen (that is why we call them accidents, after all). Picture an Ajax resident on route to a nearby coffee shop to get some much needed caffeine before the work day begins. Typical of Ontario winters, snow is piled on both sides of the sidewalk, and a new layer has fallen overnight. The sidewalk itself has been shoveled and salted, but the steps up to the coffee shop door are still crusted with ice. In a hurry to make his purchase and get to work on time, the man ascends the steps too quickly, slips on the ice, and falls, fracturing his ankle and ultimately requiring a lengthy surgery to implant metal pins and a plate to reconstruct the broken bone. The process, in addition to being painful, forces him to miss several days (if not weeks) of work. Thousands upon thousands of such cases are reported every year in Ontario, and Ajax is no exception. Whether due to workplace negligence, an unfortunately timed spill, or a grueling dose of typical winter weather, slip, trip, and fall accidents will continue to occur. The best course of action for those who find themselves suffering from a fall is to contact a personal injury lawyer immediately. 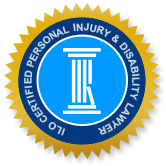 The Injury Lawyers of Ontario (ILO) are specialized in slip, trip, and fall cases, as well as other personal injury claims including insurance disability claims, vehicle accidents, wrongful death and product liability claims. Our experience in personal injury enables us to provide the highest quality legal representation and correspondingly, achieve the best result for our clients. If you are unable to visit our office, then we can come to you. Through our initial consultation, we can determine whether you have a justifiable claim and begin a claims process built on your individual circumstances. ILO legal staff can answer your questions concerning the value of compensation that you should expect to receive, how long the process is likely to take, and which experts, medical and legal, should be consulted both for your claim and rehabilitation. Timing is important in reporting and making a claim, so we urge you to contact our office at your earliest convenience.